Adults Living Large is an adult day program designed for adults 18 and older. This program provides year-round social and recreational activities to increase independence and enhance quality of life. Weekly activities will include field trips in the community, exercise, cooking, shopping, budgeting, laundry, arts & crafts, games, gardening, service projects, outings and many more! The program offers flexibility for parents and their busy schedules. Parents have the option to sign up for one to five days per week. Centralized Transportation is offered for this program for an additional fee. For more information on the Adult Day Program, contact Ashlee O’Hern at 815-407-1819 ext. 200 or aohern@nwcsra.org. 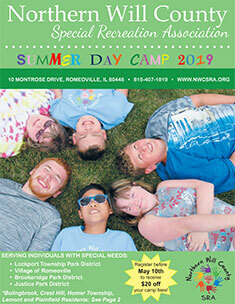 Northern Will County Special Recreation Association day camps are designed to fit all campers’ needs. Camp activities include crafts, games, sports, swimming and field trips. Northern Will County Special Recreation Association offers many options for summer day camp. Camps are also held during school and holiday breaks during the school year. For more information on day camps, contact Megan Siebert 815-407-1819 ext. 202 or msiebert@nwcsra.org. If you’re ready for some fun times and cool adventures, sign up for Camp Carefree. Don’t just sit around all summer wishing you could be having fun at day camp. Summer Explorers offers an afternoon of fun, friends and recreation that immediately follows Valley View School District’s Extended School Year program. Summer Adventurer’s immediately follows District 92’s Extended School Year program. This camp focuses on developing social skills, and maintaining the skills learned throughout the school year. Camp Independence is built around creating independence in individuals through recreation. It is the perfect camp to help teens socialize, make new friends and become active members in the community. A great way to stay in shape and work up a sweat is to register for one of many fitness programs offered at Northern Will County Special Recreation Association. Once you get in the water, you won’t want to get out! For more information on fitness and aquatics programs, contact Hannah Morris at 815-407-1819 ext. 205 or hmorris@nwcsra.org. Listed below are a few of the fitness and aquatic programs offered. Fitness Frenzy is a program that focuses on creating a healthier you. Whether you are looking to get in better shape, tone your muscles or increase your flexibility and strength, this program is perfect. Yoga is great for all ages. This program helps participants increase flexibility, balance and their overall physical and mental wellness. Swim Lessons utilizes techniques and activities geared towards developing swim skills while emphasizing safety in the pool. Swim lessons are individualized and each participant will work at their own level of ability. Discover Scuba Experience is a great opportunity to learn about scuba diving in a safe environment, with certified instructors and volunteers from Diveheart. Sometimes the best option for a child, teen or adult with a disability is to remain in their own community’s recreation programs, but with a buddy to tag along. Those buddies (inclusion aides) are available to support participants as an affirming and encouraging presence within their own community’s program or camp. That’s where we come in. Inclusion services are offered to participants of programs offered with NWCSRA’s 4 member districts at no additional cost to the family. Once a need has been identified and communicated to one of our member district staff, an inclusion request is submitted, and we take it from there. NWCSRA’s inclusion services also include, when necessary, staff training, program modifications/adaptations, modified equipment and program observations. If you would like to learn more about inclusion services, contact Hannah Morris at 815-407-1819 ext. 205 or hmorris@nwcsra.org. Here at Northern Will County Special Recreation Association, we try to keep our participants as social as possible by offering a wide range of weekly and one-time social programs such as Movie Mania, Diner’s Club and many more. ACES is a community-based service club for adults with a disability. Members plan and experience community service projects, fundraising, and educational presentations while developing importing skills in the process.If you need more information on ACES Club, contact Ashlee O’Hern at 815-407-1819 ext. 200 or aohern@nwcsra.org. 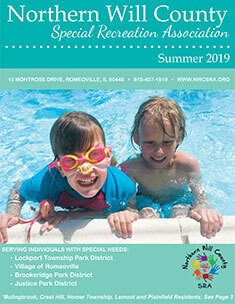 Northern Will County Special Recreation Association attends and offers multiple dances each season with other cooperating agencies in the south suburbs. The Hawaiian Luau Dance is offered by Northern Will County Special Recreation Association in July and the Turkey Trot Dance is offered in November. Dances are a great way to meet new friends from neighboring Special Recreation Associations and catch up with old friends.If you would like to learn more about our cooperative dances, contact Ashlee O’Hern at 815-407-1819 ext. 200 or aohern@nwcsra.org. Bring the whole family out to family events offered each season. Past events have included Family Bingo Night, Family Bowling Night and Family Picnic & Bean Bags. Contact Megan Siebert for family programs at 815-407-1819 ext. 202 or msiebert@nwcsra.org. To find out more about our Special Olympics programming, contact Hannah Morris at 815-407-1819 ext. 205 or hmorris@nwcsra.org. Listed below are what Special Olympics sports are offered each season. Northern Will County Special Recreation Association offers a number of unique special events each season. Some have included plays, local and professional sporting events, dining out, museums, and much more! If you would like to learn more about special events, contact Ashlee O’Hern at 815-407-1819 ext. 200 or aohern@nwcsra.org.